The Desert Sage is published six times a year as the Section's official newsletter by the Desert Peaks Section of the Angeles Chapter of the Sierra Club. Anyone can subscribe to the Sage, including those who are not members of the Section or the Sierra Club, by sending $10 for a one year subscription to the DPS Membership Chair, 1556 21st Street, Manhattan Beach, CA 90266. Make check payable to The Desert Peaks Section. Sorry, we cannot process credit cards or accept cash payment. Beginning in 2018 the DPS would like to welcome new members and subscribers (who don’t yet meet the criteria for membership) with a year’s free subscription to The Desert Sage. New members as well as new subscribers should send the membership application form to the Membership Chair, Ron Bartell by email (desertpeakssection@gmail.com) or USPS (the form with the address may be downloaded in Word or Adobe Acrobat format at http://desertpeaks.org/aboutus.htm). Although the Sage is available to all on the web site, members and subscribers receive an email with a link as soon as a new issue is published. 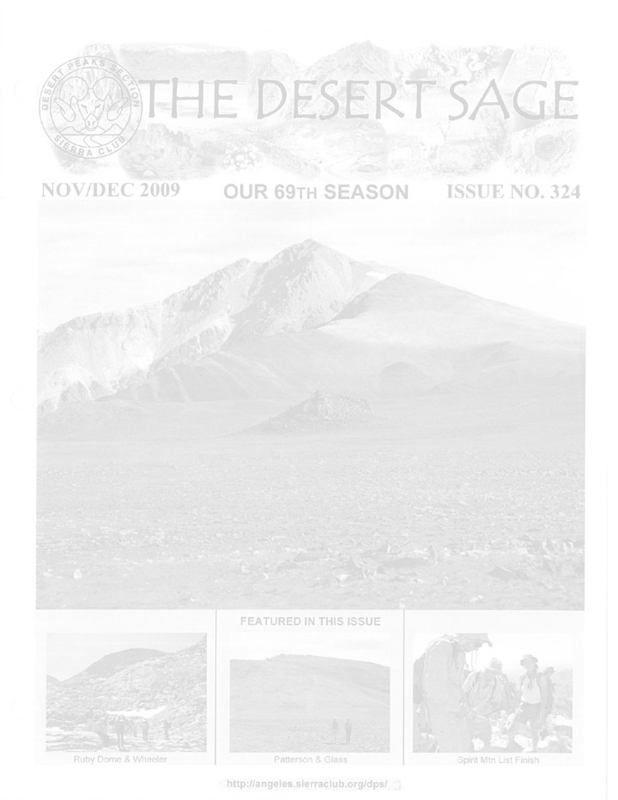 Back issues of the Desert Sage from issue 294, Nov - Dec 2004, and onwards are available on this website for viewing and downloading in the Adobe Acrobat format. Note: Issue 341, Sept - Oct 2012 and issue 342, Nov - Dec 2012 have been combined, printed and distributed as a double issue. The first 293 issues of the Section Newsletter are available on compact disk in the HTML format. This disk also inclues many photographs from the early days of the Section. Over 7,500 pages and over 6,600 images with nearly 1,300 quality photographs of members are contained on the compact disk. It is available for $15.00, postage and handling included. Mail your orders to the DPS Merchandiser, 11755 Entrada Ave, Porter Ranch, CA 91326. Make check payable to The Desert Peaks Section. Sorry, we cannot process credit cards or accept cash payment. Proceeds from the sale of merchandise are used for the operating expenses of the Section.